Dr. Denis Alexander is a big advocate for the dialogue between science and religion, science and the Christian faith. He has made a substantial contribution in this field through speaking, writing and co-ordinating sessions at the Faraday Institute for Dialogue on Science and Religion at Cambridge University. His Test of Faith DVD series has helped people around the globe to think more robustly about the various issues of cosmology, neuroscience, genetics and origins. He has hosted an international lighthouse for this discourse. Denis has been a visiting lecturer for the UBC Graduate & Faculty Christian Forum. He is the author of impressive tome Rebuilding the Matrix: Science and Faith in the 21st Century (Oxford: Lion Publishing, 2001). We think he represents the academic image of a scholar/scientist and a gentleman at its best. 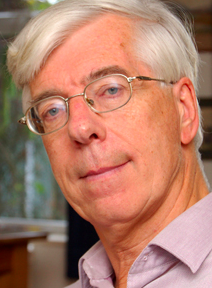 Denis Alexander is the Emeritus Director of the Faraday Institute for Science and Religion, St Edmund’s College, Cambridge, where he is a Fellow. Dr Alexander was previously Chairman of the Molecular Immunology Programme and Head of the Laboratory of Lymphocyte Signalling and Development at the Babraham Institute, Cambridge. Prior to that Dr. Alexander was at the Imperial Cancer Research Laboratories in London (now Cancer Research UK), and spent 15 years developing university departments and laboratories overseas, latterly as Associate Professor of Biochemistry in the Medical Faculty of the American University of Beirut, Lebanon, where he helped to establish the National Unit of Human Genetics. Dr Alexander was initially an Open Scholar at Oxford reading Biochemistry, before obtaining a PhD in Neurochemistry at the Institute of Psychiatry in London. Dr Alexander writes, lectures and broadcasts widely in the field of science and religion. From 1992-2013 he was Editor of the journal Science & Christian Belief, and currently serves on the National Committee of Christians in Science and as a member of the executive committee of the International Society for Science and Religion. Alexander, D. R. (2001) ‘Rebuilding the Matrix – Science and Faith in the 21st Century’, Oxford: Lion Publishing, hb 512 pp. pb edn 2002. US hb edn 2003; French edn 2004; Turkish edn 2010; Chinese edn 2013. Alexander, D.R. and White R.S. (2004) ‘Beyond Belief – Science, Faith and Ethical Challenges’ Oxford: Lion Publishing. Alexander, D.R. (Ed + Chapter). (2005) ‘Can We Know Anything? Science, Faith and Postmodernity’, Leicester: Apollos. Alexander, D.R. (2008) ‘Science and religion – negotiating the 21st century rapids’, in A. Bentley (ed) The Edge of Reason, London: Continuum. Alexander, D.R. (2008) ‘Creation or Evolution – Do We Have to Choose?’, Oxford: Monarch. Alexander, D.R.and Numbers, R.L. (eds) (2010) ‘Biology and Ideology from Descartes to Dawkins’ University of Chicago Press. Alexander, D. R. (2011) ‘The Language of Genetics – an Introduction’. Philadelphia: Templeton Foundation Press and London: Darton, Longman & Todd. Alexander, D.R. (2012) ‘A Critique of Intelligent Design’ in Darwinism and Natural Theology: Evolving Perspectives (ed Andrew Robinson), Newcastle: Cambridge Scholars Publishing. Alexander D.R. (2012) ‘Science and Religious Belief in the Modern World: Challenges and Opportunities’ in Science and Religion: Christian and Muslim Perspectives (ed David Marshall), Georgetown University Press, pp 35-45. Alexander, D.R. (2013) ‘The Implications of Evolution for Religious Belief’ in K. Kampourakis (ed) Philosophical Issues in Public Education, Springer, In Press. Ogilvy, S., Louis-Dit-Sully, C., Cassady, R.L., Alexander, D.R. and Holmes, N. (2003) J.Immunol. 171:1792-1800. ‘Either of the CD45RB and CD45R0 isoforms are effective in restoring T cell, but not B cell, development and function in CD45-null mice’. Turner S.D., Tooze R., Maclennan K, and Alexander D.R. (2003) Oncogene 22: 7750-61 ‘Vav-promoter regulated oncogenic fusion protein NPM-ALK in transgenic mice causes B-cell lymphomas with hyperactive Jun Kinase’. Zhao, R., Yang, F.-T., and Alexander, D.R. (2004). Cancer Cell, 5: 37-49. ‘An oncogenic tyrosine kinase inhibits DNA repair and DNA damage-induced Bcl-xL deamidation in T cell transformation’. Alexander, D.R. (2004) Cell Cycle 3: 584-7 ‘Oncogenic tyrosine kinases, DNA repair and survival’. Alexander, D.R. (2005) ‘Biological validation of the CD45 tyrosine phosphatase as a pharmaceutical target” in L.A.Pinna and P.W.Cohen (eds) ‘Handbook of Experimental Pharmacology’, Springer. Elliott, J.I., Surprenant, A., Marelli-Berg, F.M., Cooper, J.C., Cassady-Cain, R.L., Wooding, C., Linton, K., Alexander, D.R. and Higgins, C.F. (2005). Nat. Cell. Biol. 7: 808-816. ‘Membrane phosphatidylserine distribution as a non-apoptotic signaling mechanism in lymphocytes’. Salmond, R.J., Huyer, G., Kotsoni, A., Clements, L. and Alexander, D.R. (2005) J. Immunol. 2005, 175: 6498-6508. ‘The src Homology 2 Domain-Containing Tyrosine Phosphatase 2 Regulates Primary T-Dependent Immune Responses and Th Cell Differentiation’. Turner S.D. and Alexander, D.R. (2006). Leukemia 20: 572-82. ‘Fusion Tyrosine Kinase Mediated Signalling Pathways in the Transformation of Haematopoietic Cells’. Zhao,, R., Oxley, D., Smith, T.S., Follows, G.A., Green, A.R. and Alexander, D.R. (2007) Plos Biology, doi:10.1371/journal.pbio.0050001. ‘DNA Damage-induced Bcl-xL Deamidation is Mediated by NHE-1 Antiport Regulated Intracellular pH’. McNeill, L. Salmond, R.J. Cooper, J.C., Carret, C.K., Cassady-Cain, R.L., Roche-Molina, M., Tandon, P., Holmes, N. and Alexander, D.R. (2007) Immunity 27: 425-437. ‘The differential regulation by CD45 of Lck kinase phosphorylation sites is critical for TCR signalling thresholds’. Rider, D.A., Havenith, C.E.G., de Ridder, R., Schuurman, J., Favre, C., Cooper, J.C., Walker, S., Baadsgaard, O., Marschner, S., van de Winkel, J.G.J., Cambier, J., Parren, P.W.H.I. and Alexander, D.R. (2007) Cancer Res. 67: 9945-9953. ‘A human CD4 monoclonal antibody for the treatment of T cell lymphoma combines inhibition of T cell signaling by a dual mechanism with potent Fc-dependent effector activity’. Zhao, R., Follows, G.A., Beer, P.A., Scott, L.M., Huntly, B.J.P, Green, A.R. and Alexander, D.R. (2008). New England J. Medicine, 359: 2778-2789. ‘Inhibition of the Bcl-xL deamidation pathway in myeloproliferative disorders’. Alexander responded to Stephen Hawking‘s The Grand Design by stating that “the ‘god’ that Stephen Hawking is trying to debunk is not the creator God of the Abrahamic faiths who really is the ultimate explanation for why there is something rather than nothing”, adding that “Hawking’s god is a god-of-the-gaps used to plug present gaps in our scientific knowledge.” “Science provides us with a wonderful narrative as to how [existence] may happen, but theology addresses the meaning of the narrative”. Denis shows due respect to other skeptical scientists like Oxford’s Richard Dawkins as a biologist, but questions his wisdom on religion and in fact asks why he would attempt to step outside his area of expertise in the way that he has. Can We Be Sure About Anything? : Science, Faith and Postmodernism (2005), Apollos, Nottingham, UK. Science, Faith, and Ethics: Grid or Gridlock (2006), Denis Alexander & Robert S. White, Hendrickson. Rescuing Darwin – God and Evolution in Britain Today (2009), Theos Nick Spencer and Denis Alexander.